If you walk upstream from Isleworth, keeping to the river path, you will come to an elegant structure which at first inspection appears to be a foot bridge over the Thames. This is in fact Richmond Lock and Weir built by the Thames Conservancy and opened by the Duke and Duchess of York in 1894. 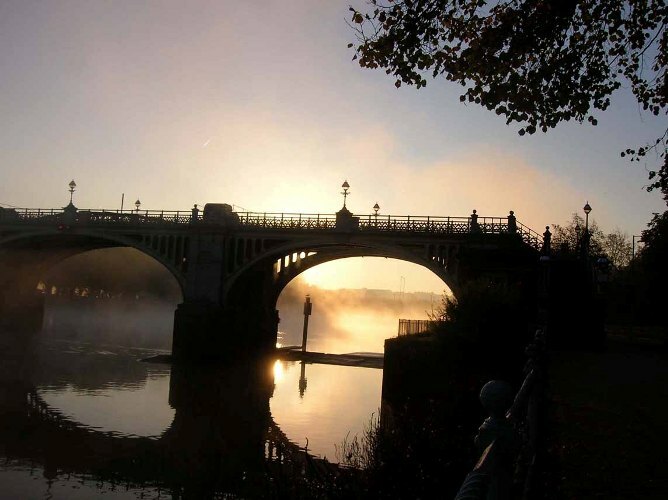 The image above shows Richmond Lock and Weir, as seen from Ranelagh Drive early on a winter morning. The structure houses sluice gates which are raised for a period of 2 hours each side of the high tide. This allows unobstructed passage for traffic on the river. When the sluice gates are lowered into the river for the remaining period of the day, the river users have to pass through the lock. The raising or lowering of the sluice gates take only a few minutes and is an almost silent operation. The structure ensures a navigable depth of water at all times upstream of Richmond. 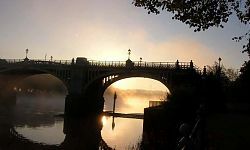 The removal of the Old London Bridge in 1832 caused the Thames tide to rise and fall in more of an extreme manner, which resulted in the Thames at Richmond and Twickenham being little more than a stream at low tide. To anyone who has not seen this take place; it’s well worth viewing live. It is usually open over the London Open House weekend.